It took them over an hour to break the deadlock, but Kingussie finally secured their Marine Harvest Premiership survival with a 2-0 victory over Kilmallie in a closely-fought promotion-relegation play-off at rain-soaked Bught Park, Inverness. Barry Dallas scored the opener and Ryan Borthwick then put the game beyond the reach of Kilmallie, who will be among the favourites to progress next season when the top two in the National Division will go up with no play-off. Despite the weather, this final game of 2015 brought out one of the largest shinty crowds of the season. Kilmallie started the better team with four attempts on goal in the first 10 minutes, the last of which, an Innes Blackhall 40-yard effort from wide left, fizzed just past the top-right corner. Kingussie began to assert themselves and Borthwick beat Robbie MacFadyen in a race for a long ball, but a weak shot trickled just wide. On a sodden pitch with sheets of water rising from the surface, both teams had difficulty finding the target although Kingussie keeper Craig Dawson pulled off a great save from Liam Cameron and, at the other end, Dallas also brought the best out of Shane Gillies. The start of the second half had a rather more cautious look to it with the teams perhaps becoming more aware of the need not to concede. Kingussie's Louis Munro did manage to hit the bar from 30 yards and the next piece of action, on 63 minutes, was the opening goal. A wonderful run by Borthwick, who impressed for the entire 90 minutes, split the Kilmallie defence and squared the ball to Dallas, who hit home from 15 yards. Kingussie sparked into life after this and Borthwick had a shot on target before grabbing Kingussie's second from close range. Then Borthwick was denied another when Gilles made a fine job of tipping his shot over the bar. 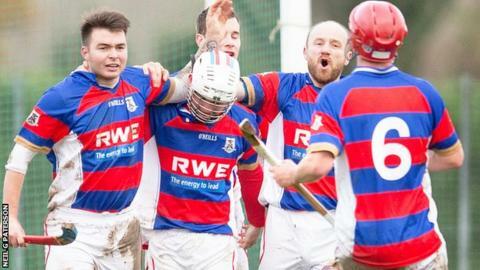 The final whistle confirmed that there would be no lower league shinty for the club that won 23 titles in 24 seasons up to 2009 but, with several older players retiring, have hit harder times of late. "It's definitely a bit of relief," said Kingussie co-manager Davie Anderson. "I'm not sure how you celebrate when there's no trophy involved so we are where we are. I think we deserved to get the result and we were the better team. "Fair play to Kilmallie and I wish them all the best for next season. Obviously two up, two down, they should be in a good position to get into the Premier League. I think we'll be talking about this in 10 years and thinking this was the day we came back." At Friday night's Camanachd Association annual meeting, Kilmallie successfully proposed a motion to scrap the play-off in favour of a two up, two down arrangement. Because of the different sizes of the top two leagues, Kilmallie had to go nine weeks without playing in advance of meeting Kingussie.